For countless millennia our planet has witnessed the rise and fall of peaceful societies and those of cruel heartlessness; with a thousand shades in between. Modernity and its captains and conquers have laid claim to soil and sky, from pole to pole and horizon to horizon. These emissaries of past conquest have shaped entire continents through the wave of a pen or the sharp tip of a sword. Throughout history the impetus to control a free land and its people has been driven by hunger to exploit natural and human resources, fostering redistribution and consumption that takes from all, for the benefit of a few. In this moment, in this newly formed nation we seek to be the exemplar for a new form of government. A government that is centered on science not subjugation. A nation driven by charity not consumption. A people driven by social and environmental stewardship. Our nation is established on the last terra nullius land remaining on Earth. Forgotten by both time and humanity, the ancient land of Bir Tawil, placed between Egypt and Sudan, is ungoverned by any nation. The dawn of our nation begins as a blank slate in an arid, desolate desert. Through the charity of the world community and the disciples of modern science, we will construct the most fertile, ecologically sensitive nation on Earth. 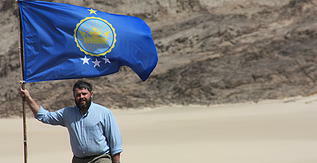 In the spirit of peace and progress, with the date of 16th of June, 2014 and in accordance with international law, I, Jeremiah Heaton lay claim as Sovereign Monarch for the Kingdom of North Sudan.